The European Union must not pass up on the historic chance to enshrine transparency rules for oil, gas, mining and logging companies in European law, warned Friends of the Earth Europe today, together with the Publish What You Pay coalition. The laws needed would ensure transparency in deals and agreements made between extractive companies registered in Europe and governments around the world. Requiring these companies to publish what they pay to governments for the rights to drill for oil and gas, mine minerals or produce timber would enable citizens to see if their country is benefiting from the exploitation of its natural resources, and to see if companies are breaking European corruption laws. The proposed laws, known as the European Accounting and Transparency Directives, are being negotiated between the European Parliament and ambassadors from EU member states, with an agreement possibly being reached by the end of the year. But, extractive industries, particularly the oil industry, want to stop these laws in Europe and similar laws due to come into effect in the United States, under section 1504 of the Dodd-Frank Act. An industry grouping of extractive companies, including BP and Shell, have hired GPlus Europe, a lobbying firm which gained notoriety after being suspended from a registry of Brussels lobbyists for failing to disclose the names of its clients, to try and prevent the European Accounting and Transparency Directives being passed, or at least to water down the laws’ effectiveness. 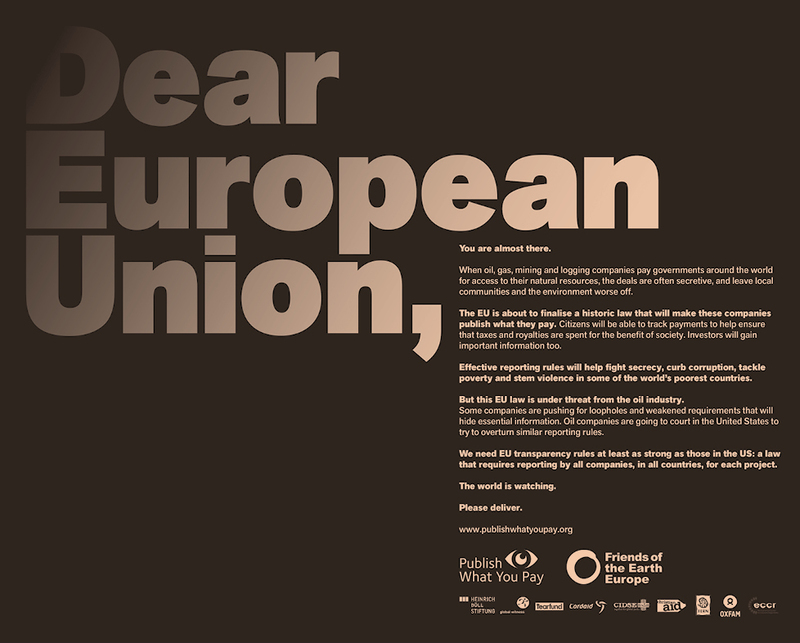 Friends of the Earth Europe and the Publish What You Pay coalition are concerned about the oil industry trying to exert influence over the legislative process, and have published an advertisement in The Financial Times urging the EU to go ahead with strong transparency laws. Only with strong transparency laws requiring project-by-project reporting of deals made, a low disclosure threshold and no reporting exemptions will we be able to force companies to come clean about the payments they make to governments.